Tooth Injuries: What to do? If the baby tooth is dislodged, it can’t be replaced and there isn’t any need of putting it back in. However, permanent teeth that are comparatively sharply defined can be protected if the necessary action is taken on time. Did you know that permanent teeth will most likely survive if replaced within half an hour? If you ever break your permanent tooth or have a chipped tooth, it is best that you know about the right steps to take in case of emergency. You should start with collecting every piece of the tooth and then rinsing the affected area using warm water. A cold compress is used for holding on the injured tooth. It is also essential to make sure that you see your dentist at Worthing Dental Centre immediately. 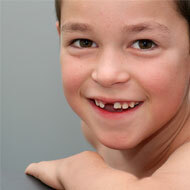 If your permanent teeth have knocked out, the first step is holding the tooth by its crown without touching the root. The tooth should then be rinsed with milk or saline solution. Avoid using tap water as the chlorine present in it could damage the tooth’s root. The tooth shouldn’t be scrubbed either. The most ideal place for preserving the tooth on the way to your dentist at Worthing Dental Center is in the socket. The tooth should be replaced gently while biting down on a gauze pad for keeping the tooth in place. If it appears impossible to reinsert the tooth, it should be ideally put in milk. You should use a gauze pad or handkerchief for biting down on as this tends to reduce bleeding while easing the pain.